KISSIMMEE, FLA. – Aug 9, 2017– East Coast Defender is throttling up the excitement for award-winning custom Defenders with the announcement of two new builds, “Project Ironhorse” and “Project Punisher”. Both SUVs represent the ultimate in hand-crafted custom Defender builds that extend beyond off-road capabilities into luxury performance. The two new Defenders were completed at the Rover Dome, East Coast Defender’s national headquarters located in Kissimmee, Florida. “Project Ironhorse” represents an ECD Heritage build that is a true throwback to the original. It has been rebuilt to stay as close to the original specifications, which includes a 4.6L Land Rover V8 that traces its roots back to the original Defenders. It remains true to an “old school” body style with a classic ROW dashboard and interior that sports the latest technology, including a touchscreen infotainment system and wireless charging. The heated, black leather seats combined with the diamond stitched headliner and wrapped dashboard create a luxury driving experience unlike any custom Defender on the road. Equally as impressive as Ironhorse, Project Punisher retains its Defender heritage but is considered an ECD Custom build, being upgraded with a Puma dashboard and the latest in horsepower and refinement. Powered by a GM LC9 V8 engine, the Punisher is capable of taking on the worst of off-road conditions, yet still at home on the open highway. 18-inch black Sawtooth wheels shod with BF Goodrich All-Terrain TA K02 tires, combined with the full external roll cage and LED spot lamps give the Punisher an aggressive road presence. Visit www.EastCoastDefender.comfor more information and to learn how to own a handcrafted, custom engineered Defender. Located in Kissimmee,Florida, East Coast Defender is an award-winning builder of premium Land Rover Defenders. 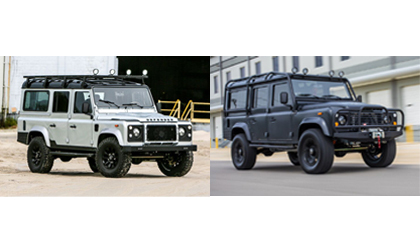 With over 25 years of Land Rover Defender building experience, ECDhas earned a reputation for its commitment to perfection, its dedication to build quality and its ability to maintain the heritage of the Defender while modernizing it for clients. East Coast Defender has grown tremendously and has expanded the term “luxury vehicle” to “all-terrain multi-functional luxury vehicle.” East Coast Defender currently has over 30 full-time employees in its 21,000 square-foot facility. For more information, please visit EastCoastDefender.com or call (407) 483-4825.